The Shenzhen smartphone maker has once again teamed up with Disney to release a special edition of their newest handset. This time it’s based on the latest Marvel blockbuster, Avengers: Infinity War. Unlike the last iteration, which was randomly released a month after the handset, OnePlus has decided to announce it alongside the standard model. The OnePlus 6 follows a completely new design, with a glass back and the infamous notch placed up front, making it somewhat reminiscent of a certain fruity company. Regardless, it’s a new horizon for OnePlus and the 6 features a ton of processing power, along with some impressive features. If you’re looking to build a kickass PC to complement your new smartphone, be sure to head to Gpunerd.Com and check out just what you need to make your dream rig come to life. Unlike the minimalist plain white stylings of the standard edition OnePlus 6 box, the Avengers edition features a more detailed packaging. The black box features the Avengers logo embossed on the front. Open it up and you’re greeted with the handset itself. Opening it up further will reveal the charging accessories and literature, along with a message from the OnePlus team. Unlike the Star Wars Edition, there are no hidden Easter eggs this time. There is, however, a gold medal of sorts. The medal is an arrow shape and features a metal construction adorned with a consistent gold coating. 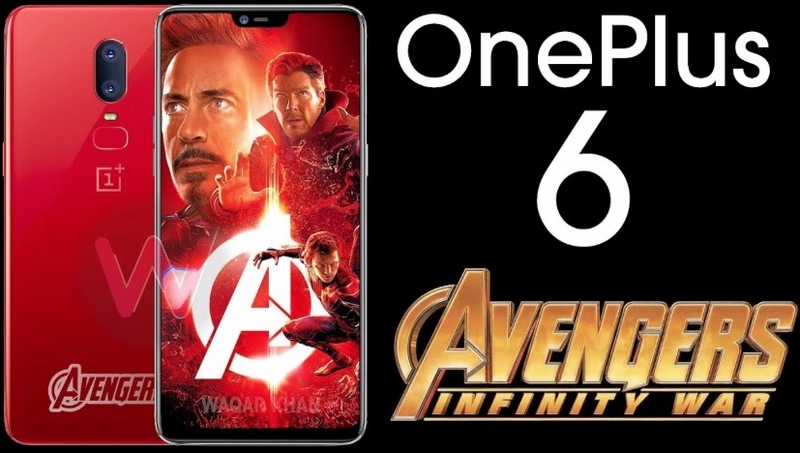 On one side you’ll find the OnePlus logo, Marvel branding, and the Avengers “A.” Flip it over and you’re greeted with one of six unique Avenger insignias. The idea is to collect all six and form a complete single piece with the Avengers logo. How one is to collect all six is a mystery given that it would require buying at least six phones, if not more seeing as you never know which medal you’re going to get. Regardless, it’s a nice touch and a worthy collector’s item. Unlike the plain gloss back of the standard edition, the Avengers Edition is adorned in a carbon fiber-look pattern with gold accents on the mute slider, OnePlus logo, and the Avengers logo at the bottom. Carbon and gold accents aside, the phone remains unchanged. Included is an Avengers rubber case constructed to be about as thick and sturdy as a case can be. The back features the iconic Iron Man mask sculpted around the camera hole. It’s a little on the chunky side and the bulging design makes it rock on flat surfaces, but it’s sure to keep your phone safe, which is important when it is as fragile as the 6. The Avengers Edition comes pre-installed with five unique wallpapers, a custom clock widget and an Avengers theme, which is essentially a dark theme with yellow accents. It’s a little lackluster compared to last year’s iteration, but there’s no changing that now. How difficult the Avengers Edition will be to pick up depends on your region and budget. Whether it’s worth the price premium is for you to decide. Next post: Salesforce Chatter Messenger is No More: What Now?